Woo finished! 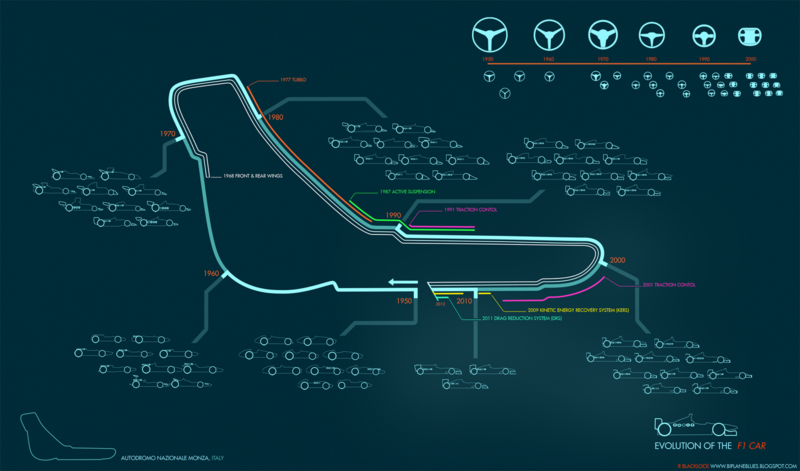 This map tracks the history of F1 cars across the circuit at Monza. Hopefully its clear enough... its my first infographic, let me know if you have any keen ideas to improve readability. One of the greatest timelines I have ever seen. Thank you. i dont think i quite understand what the groupings are for, or what the year indicates? is it faster sectors with the advancement of the technology? But one very big revolution is missing: ground effects! I would love a poster sized image of this. Do you have a higher-rez image, or plans to sell a poster? very cool, never seen this before. Did you do the infographic design yourself? Awesome post I might want to thank you for the endeavors you have made in composing this fascinating and learned article and here you can get helpful material about topic. With the virtual PBX voice mail system activated, you have the features of a high expensive phone in a cost effective manner. professional voice mail greeting that is rally good for any voice over service. Sometimes writing will give you an extra imagination eyes which will let you see the outer world and let you have your thought. http://www.verbatimtranscriptionservices.com/ to check out more helpful guide and tips for writing your papers. Is it true?I am so excited to have this video.If you remember last time I recommended you http://www.interactiveagencies.net/the-role-of-a-full-service-advirtising-agency/ as it is very effective site for learning. This map is quite confusing.I actually could not understand this post but let me ask my http://www.manuscripttyping.com/faq/ team about this.May be they understand this. At times creating will provide you with a supplementary creativeness face which usually allow you to start to see the outside planet and also enable you to have got the considered. http://www.besttypingservices.net/faqs-on-typing-services-rates/ to see a lot more beneficial information and also methods for creating the paperwork. Your ideas are very useful which help me to Design My Infographic for my business and services. Thank you for sharing this post. I hope you will post the same as in the future!